with cashew lime custard filling & spicy almond coconut pastry. Pies often evoke memories of childhood. 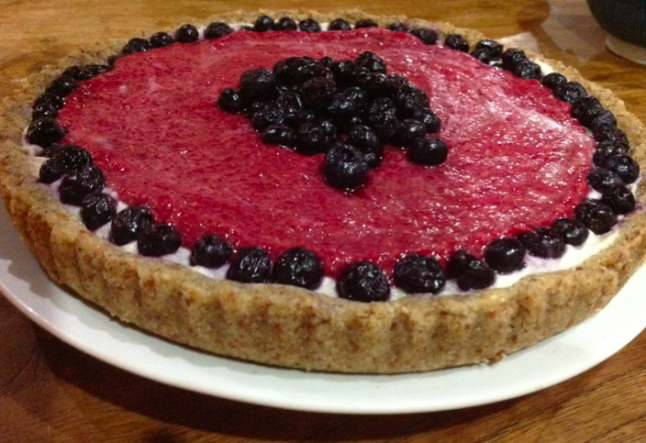 Making this raw raspberry blueberry pie with loved ones can create new memories and traditions. For the crust: Place the almonds in the bowl of a food processor and grind them. Add the coconut and process for a minute or so. Then add in the dates, coconut oil, salt & spices if using. Process until everything is incorporated. Remove from bowl and press into the bottom and side of a 9 inch (lined with parchment/baking paper) pie pan. Place in the freezer while you make the filling. For the filling: Place the cashews and the nut milk in the blender. Blend well, and then slowly add in the lemon juice, coconut oil, dates, vanilla and salt. If this is too thick and isn’t blending you can add more nut milk (if available) or add a little filtered water, if you need to (no more than cup). Blend until very creamy. Stir through the lemon rind. Place in the refrigerator until ready to serve. To make the Raspberry Jam, place the raspberries & psyllium into a blend and blend until combined. If it is too tart, add a teaspoon max. of raw honey or agave. Remove the crust from the freezer about 20 minutes before serving and pour in about half of the filling. Place half the raspberry jam and scatter about half of the berries on top, then the rest of the filling. Pour over the rest of the jam & arrange the remaining berries on top. Or, if you wish to assemble straight away, do so and place in the freezer for a few hours, and leave at room temperature for at least an hour before serving. Store leftovers in the refrigerator, it will last around 3 days. 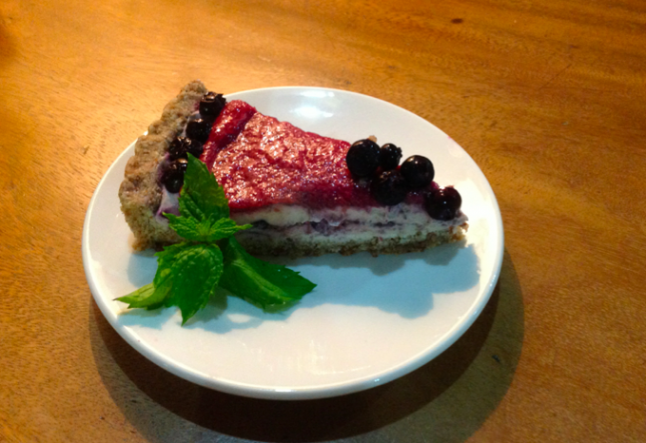 2 cups fresh blueberries or use any berries you like!